Due to uncertainty and high financial risks, introducing a new brandin today's competitive marketplace has become increasingly difficult.Strategic Brand Alliance (SBA) is a widely accepted market entry strategyfor many companies where two or more branded products are combined.In SBA, established brand names are valuable intangible assets that canbe transferred to partner brands, thus the risks are reduced. As a baselineinquiry into the phenomenon of SBA, it is important to first investigatehow communication strategies are formed in an alliance situation.This study explores how various forms of SBA are communicated inmagazine advertising. A total of 575 SBA ads between 2004 and 2008 werecontent analyzed. Shared usage is the most popular communication strategyin SBA ads. In particular, shared usage is the dominant communicationstrategy for joint marketing and promotion. In vertical distribution, sharedattribute and shared usage were used equally often as a communicationstrategy compared with horizontal distribution. Shared usage was employedmore often in both domestic and cross-border SBA. Rational appealis the dominant advertising appeal for all business form, distribution type,and shared usage situation. Finally, shared usage was the most widely usedcommunication strategy for both rational and emotional appeals.Discussion and suggestions for future research are provided. SBA has been studied under various terms such as ingredient brand alli-ance, co-branding, co-marketing, cross-promotion, joint branding, joint promotion, and symbiotic marketing (Kippenberger, 2000; Uggla, 2004, 2006). These terms share a commonality in that they all refer to collabo-rative partnerships that involve linking or integration of the attributes of two or more brands to offer a new or perceptually improved product or serv-ice to consumers in domestic and global markets (Cooke & Ryan, 2000; Xie & Johnson, 2004). As such, Simonin and Ruth (1998) defined SBA as the short- or long-term association or combination of two or more in-dividual brands, products, and/or other distinctive proprietary assets (p. 30). Elmuti and Kathawala (2001) further defined SBA as a partnership of two or more corporations or business units that work together to achieve strategically important objectives that are mutually beneficial (p. 205). SBA, a frequent business tactic these days, takes on various forms (Bluemelhuber et al., 2007; Kalligiannis, Iatrou, & Mason, 2006). Coopers and Lybrand (1997) identified these forms as: joint marketing and promo-tion (54%), joint selling or distribution collaboration (42%), production collaboration (26%), design collaboration (23%), R&D contracts (19%), and other outsourcing purposes (19%). Joint marketing and promotion is a partnership in which at least two companies collaborate to achieve mu-tually beneficial objectives (e.g., McDonald and Coke). Joint selling or distribution collaboration is a partnership between companies to distribute products in the same channel (e.g., Issac Mizrahi brand that is sold ex-clusively at Target). The goals of production collaboration (e.g., Philishave razor and Nivea lotion) and design collaboration (e.g., Porche design and Poggenpohl kitchen; The Art of Shaving and Gillette Fusion Chrome Collection) are to improve product quality and design respectively. In addition, cross-border or transnational alliance is a specific form of brand alliance where one of the companies is headquartered in a host coun-try while the other is located in a different country and market (Bluemelhuber et al., 2007). Due to the high uncertainty and competition in the global market, a single company is unlikely to initially develop or build resources in all of the necessary fields for successful market entry (Beverland & Bretheton, 2001; Gammoh & Voss, 2011). SBA helps partner companies obtain new technology, gain distribution channels to local mar-kets, minimize financial and political risks, and achieve or ensure com-petitive advantage (Elmuti & Kathawala, 2001). Cross-border alliance en-ables partner companies from developing countries to market their prod-ucts or services effectively to developed countries without facing coun-try-related stereotypical judgments (Javalgi, Radulobvich, Pendleton, & Scherer, 2005). Meanwhile, for companies from developed countries, SBA can ease entry into an emerging market because the local company can provide needed market knowledge, efficient promotions, easier access to distribution networks, and suppliers (Norris, 1992). Specific to the channels of distribution, SBA can be considered as either a horizontal or a vertical alliance (Samu, Krishnan, & Smith, 1999). Horizontal alliance is where two brands involved are at the same level of the channel of distribution (e.g., two manufacturers). On the other hand, vertical alliance is where brands involved in alliance are at different levels in the channel of distribution (e.g., manufacturer and distributor). In both horizontal and vertical alliances, SBA helps companies achieve various objectives such as increasing brand awareness and knowledge, and re-ducing advertising costs by partnering together (Park, Jaworski, & MacInnis, 1986). SBA can be further understood by its goals because they determine how two different companies are coming together. After surveying six strategic alliance companies (HP/Compaq, BMW/MINI, Sony/Ericsson, Daimler/Chrysler, IBM/Lenovo, and BenQ/Siemens), Chang (2008) con-cluded that there are generally three SBA aims. They include market share (e.g., HP/Compaq), brand extension (e.g., BMW/MINI), and global brand-ing (e.g., Sony/Ericsson; IBM/Lenovo; Daimler/Chrysler). These three goals can be sequentially expanded. Initially, companies may aim to increase market share as a market entry strategy. For instance, HP merged with Compaq and extended its lap-top/desktop market share in order to compete with IBM. Expanding market share is the fundamental purpose for existing SBA strategy. Once compa-nies achieve the market share goal, they may attempt to broaden and extend the brand. For example, BMW merged with MINI to extend its brand image in the compact car market (e.g., MINI Cooper). Since companies have al-ready established brand presence in the market, they are better able to take advantage of this opportunity to extend their brand line-up than other com-panies that do not have established brand presence. Finally, companies strive to achieve a global branding strategy by means of combining two brands. In this way, local companies are able to succeed in the global mar-kets beyond their national borders. For example, Sony and Ericsson en-gaged in a joint venture to establish their position in the global tele-communication industry. Other examples include Lenovo's purchase of IBM's PC department to penetrate the global PC market, and BenQ's ac-quisition of Siemens' telecommunication department to broaden its image as a global brand (Chang, 2008). Since more than two or more brands can be integrated into an alliance, product complementarity plays an important role in SBA communication. Product complementarity is the relatedness of the product categories in-volved in an alliance (Simonin & Ruth, 1998). When the two product cate-gories functionally fit well (e.g., car and auto audio system), consumers can understand the combination with ease. However, when the two product categories do not fit well, consumers may become confused (Park, Jun, & Shock, 1996). In high product complementarity situations, brands are likely to have either shared usage situations or overlapping attributes. Therefore, making use of shared usage situations or overlapping attributes have been the two most commonly employed means of communicating SBA to the consumer. Samu, Krishnan, and Smith (1999) categorized existing cases of such ad-vertising alliances to illustrate how these two strategies have been employed. For example, Kellogg & Tropicana, Blockbuster & Bird's Eye, and Campbell's Soup & Oscar Mayer exemplify horizontal alliance with high product complementarity. These brands are linked together based on shared usage situations such as breakfast (Kellogg & Tropicana), dinner with a movie (Bird's Eye and Blockbuster), and delicious lunch (Campbell soup & Oscar Mayer). Whereas, although Tide & OshKosh B'gosh and American Eagle Outfitters & Dodge Dakota show horizontal alliances, their advertising strategies focused on shared attributes such as cleanness and style respectively. However, it should be noted that even though advertisers may focus on the common attributes that are shared by many brands within a product category (e.g., cleanness attribute in detergent and sound quality in stereo), the perceptual distance among shared attributes and product categories could be different depending on how easy/difficult it is to infer the relation-ship in SBA (Dhar & Sherman, 1996; Krishnan, 1996; Sujan & Bettman, 1989). For example, Tide and OshKosh share the same attribute of clean-ness which is commonly used by many other brands in detergents and child-ren's clothing product categories. In this case, consumers can easily under-stand why the two brands are together because they infer the close linkage between cleanness, laundry detergent, and children's clothes (Samu et al., 1999). The brand and category links in both directions are therefore strengthened because the shared attribute cleanness is normally associated with both product categories. Consumers who are exposed to an advertise-ment that focuses on a closely shared attribute in the product category are more likely to perceive the brand as representative of its product category. The strengthened link between category and brand (e.g., detergent ? Tide) heightens brand awareness when the product category is mentioned. On the other hand, consumers may find it difficult to infer a shared attrib-ute if the attribute is intangible (e.g., social personality) and distant from the core attribute that represents a product category (e.g., cleanness). Thus, extensive processing of the category link may be needed because the rela-tionship is unfamiliar to them (Mandler, 1982). While consumers may eventually find the meaningful relationship between the two product cate-gories, the brand and category links are not strengthened because this attrib-ute is not normally associated with the two product categories. Another perspective to consider how SBA may be communicated to the consumer is the appeals used in the ad. The use of emotional versus rational appeals has been studied extensively in the marketing and advertis-ing literature (Albers-Miller & Stafford, 1999). The concept of rational appeal comes from the traditional information processing models of deci-sion-making in which consumers are believed to make logical and rational decisions. This type of appeal is designed to change consumer beliefs and attitudes about the advertised brand based on their persuasive arguments or reasons. In contrast, emotional appeal is related to the emotional, experi-ential aspects of consumption (Albers-Miller & Stafford, 1999). Emotional appeals tend to create good feelings about the product by gen-erating a likeable or friendly brand. RQ 1: Do communication strategies (shared usage vs. overlapping at-tributes) and advertising appeals (rational vs. emotional) differ by SBA (forms, distribution, and geographical boundary)? RQ 2: Do communication strategies (shared usage vs. overlapping at-tributes) and advertising appeals (rational vs. emotional) differ by aims of SBA (market share, brand extension, and global branding)? RQ 3: Do communication strategies (shared usage vs. overlapping at-tributes) differ by advertising appeals (rational vs. emotional)? The goal of this study is to explore various classifications and aims of SBA and how SBA is communicated to consumers via communication strategies and appeals. Even though previous research has examined types of SBA in general business, little research has been done on how SBA is communicated in print media, particularly in magazine advertising. Magazines are among the most effective media for advertising brands be-cause consumers are less likely to engage in other media consumption such as TV and Internet while they are reading (Magazine Publishers of America, 2008). Also, compared to other media types, magazines have mostly information-oriented content which tends to be trusted by consumers. Brands in magazines are also likely to be perceived as such. Therefore, SBA ads in magazines are ideal content materials for in-depth analysis. Data collection in this study is carried out in two phases. First, samples that were examined in past SBA literature were consulted. Identifying sam-ples in previous literature helps determine the important types of mag-azines for SBA. After a careful review, general interest, fashion, and busi-ness magazines were selected as the types for sampling because they tend to have the most SBA ads. For fashion magazines, Vogue and GQ were selected because they are ranked among the top five women's and men's fashion magazines respectively based on average single copy circulation for top 100 Audit Bureau of Circulations (ABC) magazines (Magazine Publishers of America, 2008). For business magazines, Fortune and Businessweek were included since they cover most business topics (Magazine Publishers of America, 2008). Most importantly, they have sec-tions that deal with small business and personal finance for general consumers. Finally, Time and Newsweek were selected for their general interest focus. The average circulation of Time and Newsweek puts them as the top two general interests/news magazines (Magazine Publishers of America, 2008). Time, Newsweek, and Businessweek are weekly magazines, whereas Vogue and GQ are monthly magazines. Fortune is a bi-weekly magazine. Magazines for the five years from 2004 to 2008 were collected and reviewed. There are two exceptions: 2009 issues for Businessweek and Newsweek were included due to their availability; samples of GQ came from 2002 to 2007 since they are the only available recent issues in archive. Duplications within a magazine across different issues or between dif-ferent magazines were not included since the focus of the study is on under-standing the characteristics of SBA ads. A total of 575 SBA ads were sam-pled from top magazines in fashion (Vogue and GQ), business (Businessweek and Fortune), and general interests (Time and Newsweek). It should be noted that sponsorship, product placement (PPL), and celebrity endorsement ads were not included in this study as these secondary alliance or product placement ads are outside the scope of this investigation. Coding schemes regarding SBA were adopted from previous studies. A product category list was obtained from Mediamark Research & Intelligence (MRI) product category classification. In addition, product categories that were not listed in the original MRI category classification were added. Appendix A shows the list. Existing classification of SBA practice forms (Coopers & Lybrand, 1997) was used. Appendix B shows the coding scheme. Also, SBA in terms of channel of distribution was ex-amined (Samu et al., 1999). Chang (2008)'s classification of SBA aim was included for this study. The geographical boundaries of SBA also were examined. In terms of communication strategy, Samu, Krishnan, and Smith (1999)'s communication strategy classification was borrowed and slightly modified for this study. Advertising appeals were examined per Albers-Miller and Stafford's definition (1999). Intercoder reliability is determined by Perreault and Leigh's method for this study. Both coders coded 190 or 1/3 of the overall ads for intercoder reliability assessment. The intercoder reliability was 0.93 which exceeded the critical value of 0.90 as suggested by Perreault and Leigh (1989). Additionally, 40 ads were randomly selected across different types of mag-azines in order to further validate intercoder reliability. Since all of the vari-ables in this study have fairly clear definitions and the coding is considered deterministic, the two coders agreed on majority of them. Therefore, the coding reached the satisfactory requirement and is considered acceptable. It was found that 57% of SBA ads featured two brands, followed by three brands (19.3%) and four brands (6.3%). For product category, it was fairly evenly distributed. Retailers (8.1%) were found to be the most domi-nant brand category, followed by telecommunications services (6.3%), home computers and computer supplies (6.0%), wireless communication devices (5.8%), electronic alliances and products (5.6%), computer soft-ware (5.3%), clothing, shoes, and apparel (4.2%), bank and financial serv-ices (3.8%), and non-profit organizations (3.7%). One of the reasons that retailer is the number one SBA product category could be that regardless of brand categories, most products are sold or distributed though retailers. Joint marketing and promotion is the most frequently used forms of SBA practice as identified in the sample ads (45.1%). Table 1 shows the summary statistics of variables of interest. Distribution collaboration (35.4%) was the second most frequently used form, followed by production collaboration (19.5%). In terms of channel of distribution type, 40.6% of SBA ads were of vertical alliance, while 59.4% of them were of horizontal alliance. In terms of geographical boundary, almost half of the SBA ads examined in this study were cross-border SBA (47.3%). However, it is in-teresting to note that 91.5% of cross-border SBA ads did not provide any country-of-origin information in the ads. Regarding the aim, 96.0% of SBA ads were designed to increase market share. Brand extension and global branding together only amounted to 4.0%. In terms of communication strategy, both shared usage situations (74.3%) and shared attributes (25.7%) were used respectively. In addition, rational appeals (65.3%) were used more often than emotional appeals (34.7%). In order to further investigate the relationship between various classi-fications and goals of SBA and their communication strategy, cross-tab analyses were conducted and the results are discussed in the following sections. Do Communication Strategy and Advertising Appeals Differ by SBA Form? It was found that communication strategy is significantly different de-pending on SBA business forms (chi-square = 87.9, df = 2, p < .00). Table 2 shows the results. The majority of SBA ads (45.1%) used joint marketing and promotion strategy followed by distribution collaboration (35.4%) and other forms (19.5%). 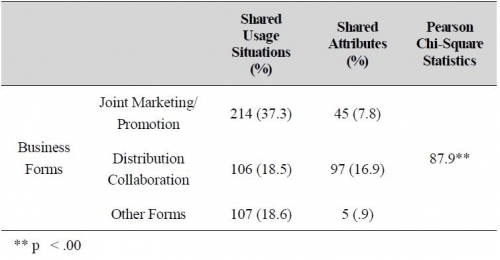 Specifically, joint marketing and promotion is likely to employ shared usage situations (37.3%) more often than shared attributes (7.8%), while there is not much difference between shared usage situations (18.5%) and shared attributes (16.9%) for distribution collaboration. The type of advertising appeals is significantly different depending on SBA business forms (chi-square = 11.59, df = 2, p < .00). Table 3 shows the results. Rational appeal is dominantly used across all different type of business forms. Specifically, the number of rational appeals (30%) is about two times greater than emotional appeals (15.4%) for joint marketing and promotion. In regards to channels of distribution, rational appeal (20.4%) is more popular than emotional appeal (14.7%). In order to further examine the relationship between distribution collab-oration and communication strategy and advertising appeals, SBA ads are divided into vertical and horizontal distribution in subsequent analyses. Do Communication Strategy and Advertising Appeals Differ by SBA Channel of Distribution? When SBA is divided into vertical and horizontal alliance according to distribution collaboration, it turns out that their communication strat-egies are significantly different (chi-square = 64.8, df = 1, p < .00). Table 4 provides the results. It was found that 23% of SBA ads used shared usage situations followed by shared attributes (17.6%) for vertical distribution. Similarly, 51.4% of SBA ads employed shared usage situations, while only 8% of ads used shared attributes for horizontal distribution. Also, advertising appeal is significantly different depending on the type of distribution (chi-square = 5.29, df = 1, p < .02). Table 5 shows the results. Both vertical distribution (24.1%) and horizontal distribution (41.1%) uti-lize more rational appeal than emotional appeal. Do Communication Strategy and Advertising Appeals Differ by SBA Geographical Boundary? Communication strategy is found to be significantly different depend-ing on geographical boundary of SBA (chi-square = 5.3, df = 1, p < .02). Table 6 presents the results. The shared usage situation was the dominant communication strategy for both domestic (37%) and cross-border SBA (37.2%). However, shared attribute is more frequently used in domestic SBA (15.7%) than cross-border SBA (10.1%). In terms of advertising ap-peal, no significant differences were found for the types of geographical boundary of SBA (chi-square = .09, df = 1, p = .77, n.s.). Do Communication Strategy and Advertising Appeals Differ by SBA Aim? Neither communication strategy nor advertising appeals were sig-nificantly related to SBA aim respectively (chi-square = 2.0, df = 2, p = .36, n.s. ; chi-square = .85, df = 2, p =.65, n.s.). Since 96% of SBA aim is market share, there is no difference between communication strategy and other SBA aims such as brand extension or global branding. These results can be understood considering the characteristics of product category lists and the types of magazines examined. Dominant product categories such as retailers, telecommunications services, home computers and computer supplies, wireless communication devices, electronic alliances and prod-ucts focus on individual consumers to increase market share. Thus, the pri-mary goal of SBA ads examined appears to be increasing market share. For the same reason, regardless of types of advertising appeals, 95.9% of SBA ads focus on market share so that no differences were found between brand extension and global branding. Do Communication Strategy Differ by Advertising Appeals? Communication strategy is found to be different depending on the type of appeals used in SBA ads (chi-square = 20.9, df = 1, p < .00). Results can be seen in Table 7. The shared usage situation is the communication strategy that is used most often in the SBA ads regardless of advertising appeal type. However, in the SBA ads with emotional appeals, the pro-portion of shared attribute (13.0%) is almost equal to those using rational appeals (12.8%), while the proportion of shared usage shows considerable differences between rational (52.4%) and emotional appeals (21.9%). The goal of this study was to explore SBA in terms of its forms, advertis-ing appeals, and communication strategies in magazine advertising. Further, the description of magazine ads related to SBA provides an over-view for researchers and advertising practitioners who strive to enter global markets successfully. Understanding how ad messages are communicated to consumers is important for advertisers from partner brands. 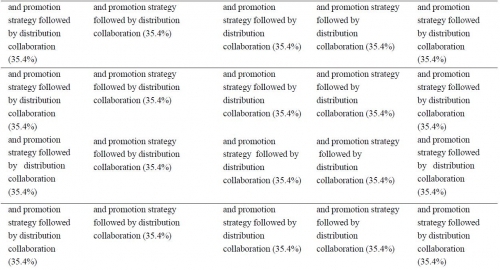 It was found that the shared usage situation is the most popular commu-nication strategy for joint marketing and promotion. In shared usage, con-sumers are unlikely to engage in cognitive elaboration to understand the relationships between two brands due to the high complementarity (e.g., Breyer's ice cream and Hershey's chocolate, Kellogg's cereal and Healthy Choice food) (Samu et al., 1999). In contrast, shared attributes generally require extensive cognitive elaboration to identify intangible hidden attributes. Since the primary goal of joint marketing and promotion, along with distribution collaboration, is to disseminate information about prod-ucts and brands and attract potential consumers, companies are more likely to choose a simplistic form of communication strategy. Related to advertis-ing appeals, rational appeal was found to be more influential across all dif-ferent types of forms of SBA such as joint marketing/promotion, dis-tribution collaboration, and other forms. It could be explained that rational appeal may help consumers easily infer the reason why two brands adver-tise together. When the distribution collaboration is decomposed vertically and hori-zontally, meaningful implications were found. For horizontal alliance, shared usage was used more often than shared attributes. When an SBA ad consists of brands at the same level of distribution (e.g., manufacturer and manufacturer or distributor and distributor), the shared usage situation is commonly used. Normally, the perception of complementarity tends to be high in shared usage compared to shared attributes because consumers do not need to engage in extensive cognitive elaboration of the SBA ad (Goodstein, 1993; Park, Jun, & Shock, 1996). For example, Adidas and Polar Electro's Project Fusion ad depicts heart rate and speed and distance monitoring equipment integrated into sports apparel. Another example could be the Asus and Garmin's Nvifone cell phone ad which focuses on location-based service and carry a Where Am I button at all times. For vertical alliance, although shared usage is more often used than shared attributes, the frequency of both situations was more evenly dis-tributed compared to horizontal distribution. When SBA is at different lev-els of distribution (e.g., manufacturer vs. distributor), companies may need to explain why two brands are combined together. It could be that vertical alliance requires consumers to find shared similarity not based on tangible or physical form, but on similarity at the conceptual and abstract levels (e.g., Martha Stewart and Kmart; Issac Mizrahi and Target; Treo Palm smartphone and Verizon wireless). Usually, identifying shared attributes at the abstract level is more demanding for consumers than finding tangible shared attributes. As a result, if consumers are unable to find shared attrib-utes between brands and understand the fit between them, brand equity, particularly for the host brand, may be negatively affected (e.g., Sam's Club and Fendi's dispute). Related to advertising appeals, it was found that rational appeal was dominant for both vertical and horizontal distribution. This could be ex-plained by the fact that focusing on product benefits or enhanced perform-ance in vertical and horizontal distribution would be more attractive than appealing to consumer emotion which could be less stable over time. In the short-term, consumers are more likely to pay attention to human emo-tions such as fear, empathy, sympathy, or happiness, but in the long-term, it will be difficult for consumers to relate the ad to collaboration. Shared usage was a dominant communication strategy in both domestic and cross-border SBA. However, shared attribute strategy was used more often in domestic SBA than in cross-border SBA. Cultural factors could be a possible reason for this finding. It would be much easier for U.S. con-sumers to understand shared attributes when an SBA involves only domes-tic brands than a cross-border SBA where either or both of the companies come from other countries. Comprehending overlapping brand attributes in SBA requires consumers to have sufficient cultural knowledge. Past study found that cultural characteristics are reflected in the construction and content of ads (Jin, 2010). McCracken (1989) also found that the mean-ing associated with a brand should be acquired by consumers to understand the advertising appeal. Unlike the results of communication strategy, there was no relationship between advertising appeal and geographical boundary. Neither rational appeal nor emotional appeal is culturally bounded. Advertisers and marketers who endeavor to enter global markets need to understand that a shared usage strategy could be more effective in terms of delivering benefits of SBA to consumers who have diverse cul-tural backgrounds. With respect to aims of SBA, communication strategy is not sig-nificantly related to SBA aim. Considering that 96% of SBA aim is for in-creasing market share, brand extension and global branding might not be reflected in this study. As most advertised brands in the magazines re-viewed are consumer goods or services, their primary goal would be to in-crease market share. Furthermore, this study found that almost half of the SBA ads had at least one brand that comes from a less developed foreign country. Nevertheless, 91.5% of SBA ads did not explicitly present coun-try-of-origin information. It could be that providing country-of-origin in-formation in SBA ads is not considered helpful in increasing the perception of brand quality. For example, 40 percent of UK consumers are less likely to buy Chinese-manufactured products due to the toy recall crisis in 2007 and 38 percent of Hong Kong consumers reduced their purchases of China-made toys and food (Blecken, 2007; Kabadayi & Lerman, 2010). Some advertisers have tried to exclude country-of-origin information to rule out any pre-existing country bias or stereotypes. Others have pre-sented country-of-origin information explicitly to take advantage of those country-related stereotypes. Most previous research demonstrated that consumers' perceptions of products from developing countries are unfairly evaluated due to the stereotypical judgment of consumers against these developing countries. However, alternatively the brands from developed countries may tend to emphasize the country-of-origin information in the SBA ads (e.g., ESQ luxury watch from Swiss and Mercedes/AMG from Germany). Future researchers need to delve into this phenomenon to un-derstand the mechanisms of how advertisers strategically deal with pos-itive or negative country images in SBA ads. 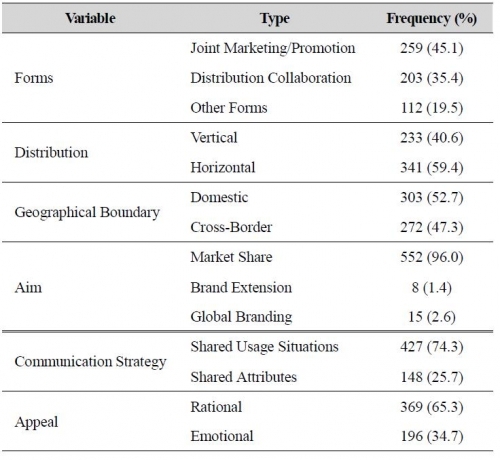 In regards to the relationship between communication strategy and ad-vertising appeals, this study suggests that shared usage is a dominant com-munication strategy. However, shared attributes tend to be employed more often in emotional appeals than in rational appeals. To be specific, SBA ads that employ emotional appeals might have focused on intangible or symbolic benefits based on shared attributes at the abstract level (e.g., fra-grance and luxury apparel; Montblanc fountain pen and Montblanc analog watch). An emotion as a felt state could serve as information itself that influ-ences how consumers process persuasive messages (Taute, McQuitty, & Sautter, 2011). In emotional appeals, product complementarity may not be as important as in rational appeals because the goal of emotional appeals is to arouse positive emotional state by having consumers associate mean-ings embedded in brands. Advertisers should be aware of how shared attrib-utes could be an effective communication strategy for emotional appeal as consumers may less care about functional fit (e.g., Intel microprocessor and HP laptop computer; Apple and Nike). While this study revealed some interesting results between various forms of SBA and communication strategy, certain limitations should be noted. This study examined only magazine ads from the past five years. Since only three types of magazines were reviewed, the relationship be-tween various forms of SBA and communication strategy may not be generalized. For the same reason, the results will be more complete if other SBA forms and communication strategies were examined across a broad range of magazine genres over an extended period of time. Also, future researchers should examine how advertisers strategically employ country-of-origin cues in SBA ads. As explained earlier, providing country-of-origin cue might evoke positive or negative attitudes, partic-ularly in emotional appeals. Therefore, it will be important for future re-searchers to analyze the relationships between product categories and country-of-origin information in SBA ads. Related to the presentation of country-of-origin information in SBA ads, future researchers need to iden-tify underlying reasons why advertisers did not explicitly present coun-try-of-origin information in the ad. Finally, product category and communication strategy need to be fur-ther explored. Understanding how goods or services are described in SBA is important to effectively communicate to consumers. Although numer-ous studies that focused on services emphasize the importance of differ-entiating communication strategy from tangible products, the results are quite inconclusive so far. Results from this study should help establish a baseline understanding of the phenomenon and pave ways for future re-search in this area. 1.Albers-Miller, N. D., & Stafford, M. R. (1999). An international analysis of emotional and rational appeals in service vs. goods advertising. Journal of Consumer Marketing, 16 (1), 42-57. 2.Beem, D. (2010). The case for co-branding. Partnership brings strength in numbers. http://www.forbes.com/2010/03/16/cold-stone-creamery-dan-beem-rocky-mountain-chocolate-cmo-network-co-branding.html (Visited: February 19, 2012). 3.Beverland, M., & Bretherton, P. (2001). The uncertain search for opportunities: determinants of strategic alliances. Qualitative Market Research, 4 (2), 88-99. 5.Bluemelhuber, C., Carter, L. L., & Lambe, C. J. (2007). Extending the view of brand alliance effects. International Marketing Review, 24 (4), 427-443. 6.Booz Allen Hamilton (2001). Smart alliances: global growth strategies: buy, build or band Together. Booz Allen Hamilton Report. 7.Chang, W. (2008). 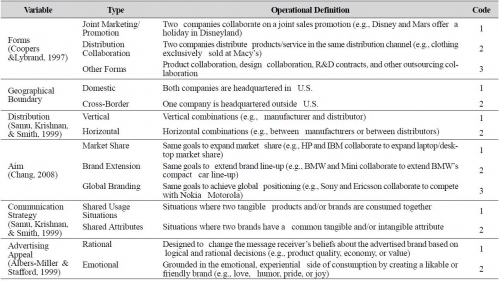 A typology of co-branding strategy: position and classification. Journal of American Academy of Business, Cambridge, 12 (2), 220-226. 8.Cooke, S., & Ryan, P. (2000). Brand alliances: from reputation endorsement to collaboration on core competencies. Irish Marketing Review, 13 (2), 36-41. 9.Coopers & Lybrand (1997), Strategic alliances, Coopers and Lybrand Barometer, Spring. 10.Day, G. S. (1995). Advantageous alliances. Journal of the Academy of Marketing Science, 23 (4), 297-300. 11.Dhar, R., & Sherman S. J. (1996). The effect of common and unique features in consumer choice. Journal of Consumer Research, 23 (3), 193-203. 12.Elmuti, D., & Kathawala, Y. (2001). An overview of strategic alliances. Management Decision, 39 (3), 205-217. 13.Gammoh, B. S., & Voss, K. E. (2011). Brand alliance research: in search of a new perspective and directions for future research. Journal of Marketing Development and Competitiveness, 5 (3), 81-93. 14.Goodstein, R. C. (1993). Category-based applications and extensions in advertising: motivating more extensive ad processing. Journal of Consumer Research, 20 (June), 87-99. 15.Hagedoorn, J. (1993). Understanding the rationale of strategic technology partnering: inter-organizational modes of cooperation and sectoral differences. Strategic Management Journal, 14, 371-385. 16.He, H., & Balmer, J. M. (2006). Alliance brands: building corporate brands through strategic alliances? Journal of Brand Management, 13 (4/5), 242-256. 17.Javalgi, R. G., Radulovich, L. P., Pendleton, G., & Scherer, R. F. (2005). Sustainable competitive advantage of internet firms: a strategic framework and implications for global marketers. International Marketing Review, 22 (6), 658-672. 18.Jin, C. (2010). An empirical comparison of online advertising in four countries: cultural characteristics and creative strategies. Journal of Targeting, Measurement and Analysis for Marketing. 18 (3/4), 253-261. 19.Kabadayi, S., & Lerman, D. (2011). Made in China but sold at FAO Schwarz: country-of-origin effect and trusting beliefs. International Marketing Review, 28 (1), 102-126. 20.Kalligiannis, K., Iatrou, K., & Mason, K. (2006). How do airlines perceive that strategic alliances affect their individual branding? Journal of Air Transportation, 11 (2), 3-21. 21.Kalmbach, C., & Roussel, C. (1999). Dispelling the myths of alliances. In S. E. Accenture Outlook (Ed. ), Cooperative Strategies in International Business (pp. 205-226). Lexington, MA: Lexington Books. 22.Kippenberger, T. (2000). Co-branding as a new competitive weapon. The Antidote, 5 (6), 12-15. 23.Krishnan, H. S. (1996). Characteristics of memory associations: a consumer- based brand equity perspective. International Journal of Researching in Marketing, 13 (4), 389-405. 24.Lin, C., & Kao, D. T. (2004). The impacts of country-of-origin on brand equity. Journal of American Academy of Business, Cambridge, 5 (1/2), 37-40. 25.McCracken, G. (1989). Who is the celebrity endorser? cultural foundations of the endorsement process. Journal of Consumer Research, 16 (3), 310-321. 26.Magazine Publishers of America (2008). Magazines: the medium of action. http://www.magazine.org/advertising/handbook/index. aspx (Visited: September 9, 2009). 27.Mandler, G. (1982). The structure of value: accounting for taste. In Affect and Cognition: The 17th Annual Carnegie Symposium, Margaret S. Clark and Susan T. Fiske, eds. Hills-dale, NJ: Laurence Erlbaum Associates, 3-36. 28.Mazur, L. (2001). The only way to compete now is with an alliance. Marketing, 15 (February), 20. 29.McKee, S. (2009). The pros and cons of co-branding. http://www.business week.com/smallbiz/content/jul2009/sb20090710_255169.htm (Vi sited: March 22, 2010). 30.Norris, G. D. (1992). Ingredient branding: A strategy option with multiple beneficiaries. Journal of Consumer Marketing, 9 (3), 19-31. 31.Park, C. W., Jun, S. Y., & Shocker, A. D. (1996). Composite branding alliances: an investigation of extension and feedback effects. Journal of Marketing Research, 33 (4), 453-466. 32._____, Jaworski B. J., & MacInnis, D. J. (1986). Strategic brand concept- image management. Journal of Marketing, 50 (October), 621-635. 33.Parkhe, A. (1993). Strategic alliance structuring: a game theoretic and transaction cost examination of interfirm cooperation. Academy of Management Journal, 36 (4), 794-829. 34.Pekar, P., & Allio, R. (1994). Making alliances work guidelines for success. Long Range Planning, 27 (4), 54-65. 35.Samu, S., Krishnan, H. S., & Smith, R. E. (1999). Using advertising alliances for new product introduction: interactions between product complementarity and promotional strategies. Journal of Marketing, 63 (1), 57-74. 36.Simonin, B. L., & Ruth, J. A. (1998). Is a company known by the company it keeps? assessing the spillover effects of brand alliances on consumer brand attitudes. Journal of Marketing Research, 35 (1), 30-42. 37.Sujan, M., & Bettman, J. R. (1989). The effects of brand positioning strategies on consumers' brand and category perceptions: some insights from schema research. Journal of Marketing Research, 26 (November), 454-468. 38.Taute, H. A., McQuitty, S., & Sautter, E. P. (2011). Emotional information management and responses to emotional appeals. Journal of Advertising, 40 (3), 31-43. 39.Uggla, H. (2004). The brand association base: a conceptual model for strategically leveraging partner brand equity. Journal of Brand Management, 12 (2), 105-123. 40._____ (2006). The corporate brand association base: a conceptual model for the creation of inclusive brand architecture. European Journal of Marketing, 40 (7/8), 785-802. 41.Vaidyanathan, R., & Aggarwal, P. (2000). Strategic brand alliances: implications of ingredient branding for national and private label brands. The Journal of Product and Brand Management, 9 (4), 214-228. 42.Washburn, J. H., Till, B. D., & Priluck, R. (2004). Brand alliance and customer- based brand equity effects. Psychology & Marketing, 21 (7), 487-508. 43.Xie, F. T., & Johnston, W. J. (2004). Strategic alliances: incorporating the impact of e-business technological innovations. The Journal of Business & Industrial Marketing, 19 (3), 208-222.